List of things I followed to heal my thyroid and related symptoms. Step 1 : Identify your root cause. There is no one underlying cause of thyroidism. Most of the time thyroidism is a result of irregularities in any one of the above rather than a faulty gland itself. Identify which one of the above may be affecting you adversely. 1.Bad sleep habits will always disrupt your thyroid. Make sure you sleep well and on time. The circadian rhythm regulates hormones. One of the reasons why you must never get your thyroid levels after a night of bad sleep is that it can notch up your tsh levels. 2. It is essential to stick to home cooked food only. Quit processed and packaged foods. Follow an elimination diet to kick out your inflammatory foods. Common ones are- dairy, soya, corn, eggs, white sugar, cauliflower, broccoli, some fruits , alcohol, seeds and nuts. 6 weeks per food is a good way to be sure of your triggers. This is one of the easiest variables to control, so pay much attention to it. 3. A clogged bowel will cause thyroid problems too. Anything less than once a day is not normal. In alternative medicine, the seat of thyroid is the intestine. One of the reasons why a good Vaidya will always give bowel cleansing preparations to treat your thyroid. 4. The liver helps in conversion of t4 to t3. Keep it optimum. Sugar is as bad a culprit as alcohol for the liver…Stay away from it. Take liver supporting herbal supplements if you need to. (Avoid liv52 by brand Himalaya as it has propylene glycol) I recommend bhumi amlaki(fresh leaves or dried), LKC capsules by Organic India or milk thistle and dandelion supplements or teas. 5. Stress: do not underestimate the ‘power’ of stress. Meditate, pray, paint, walk…whatever you can do to GENTLY relax yourself. 6. In a lot of cases, a severe and prolonged electrolyte imbalance will aggravate symptoms. Water retention will worsen. Switch to natural salt. Stop sodium chloride aka table salt. Do the kidney cleanse often. Have fresh coconut water. 7. Fatigue: Too much exercise or exertion can put your body into fight mode producing too much cortisol…It WILL disrupt sleep, cause panic attacks, anxiety or palpitations. At its worst, it will cause adrenal fatigue, which is NOT easy to heal and shockingly not recognised by doctors. 12. Soya in any form. Step 3 : Gentle exercise. Choose a form of exercise. Your exercise should be slow to medium paced that helps maintain slow and deep breathing. Do not exert. High intensity workouts may fatigue you more and aggravate inflammation and vata . Change the duration and effort as per your prevailing symptoms. 4. Surya namaskar: slow paced. *For yogasanas mentioned, a variation of each of them depending on your flexibility and mobility is possible. Ask your instructor to customise with props. Search online. You may want to look at the Iyengar style improvisations. Step 4 : Extra efforts. Take in as much sun as possible to maintain good vitamin D levels. Apply sesame/coconut oil to skin and sit in the sun for 15 to 30 mins, daily if possible. Try to expose as much skin as possible. Avoid wearing sun glasses. Please do not try to de-tan. Tanning will protect your skin from burning/rashes if you are prone to it. Make sure to avoid snacking throughout the day. Have three meals a day. If you usually feel hungry in the evening, keeping a small portion of breakfast or lunch will keep you off tea-time biscuits and nibbles. If you prefer an LCHF diet, kindly take in fats other than dairy. Ghee is an exception. Do not starve yourself or go on salad diets, they will not help in reducing weight! If digestion is sluggish, please stick to mainly cooked foods. Use the spice brew to improve digestion. Step 5 : Supportive remedies. These remedies may help in bringing relief to symptoms. These can only act as boosters to speed up healing naturally and are not a substitute to any medication you may be taking. Neither are these a substitute for the lifestyle changes mentioned in the previous steps. You may try them one at a time to see what benefits you. Please do list any that you have tried and had good experience with. * Starred remedies are feedbacks from other patients. Soak a tablespoon of coriander seeds overnight. Boil the next morning in glass of water. Drink on an empty stomach. Helps with brain fog and lethargy. 2. Coconut water 2 to 3 times a day. Helps with fatigue and reducing excess water retention. 1/4 to 1/2 teaspoon of turmeric. Boil for 5 mins and drink. May steep tea leaves in the end . Helps in digestion, bloating, inflammation. 4. *Horse gram boiled – only water to be drunk with lemon drops in it. 5. *Seetaphal leaves- Around 5 leaves boiled in 250ml water for 5 minutes. Filter and drink first thing in the morning, on empty stomach. To be taken at bedtime to aid sleep. Temper 1/4 tsp of turmeric, 1 crushed pepper corn, 1 cardamom in half a teaspoon of ghee. Add the milk of your choice, few strands of saffron and boil. 7. Kidney Cleanse – works well to balance electrolytes and reduce retention. Its a very easy and short protocol. Benefits range from draining excess water retention, more energy, feeling alert. You might want to do it once a week for the first month. 8. Liver cleanse- Extremely beneficial in the long run. Some people have been able to heal themselves after a series of cleanses. Good way to detoxify. A lot of t4 to t3 conversion depends on liver functioning. Contraindications include constipation so you may want to address that before trying liver cleansing. I used to struggle with sinusitis and rather recurrent headaches, tonsils inflammation , a running nose and chest congestion frequently while growing up. I managed to use this remedy to arrest this problem and recover. Today I am sharing this amazing remedy for you as well to benefit. Nasal congestion , ear infections and sinus headaches will no longer trouble you. Take out all the leaves from the stalks . Grind them into pulp with a little bit of water. Extract the juice out completely. Add a little bit of water and strain out the remaining again. Now you have a bit of brownish leaf extract + water. Add an equal amount of coconut oil by volume. Once all the water has evaporated, the coconut oil would have absorbed the vilva leaf extracts and turned into a dark brownish-black colour. There will be some bit of hard solids that gets formed during this process. Strain the oil to take this out. Store this oil for a few months easily. Once a week take a tablespoon of this and apply on to the top of your head. This remedy has worked on quite a few of my friends over the years. Try it and let me know how it worked. So on the day of the ride, I got delayed for some reason , got all the brevet papers and cards and headed to the starting point. As I climbed the Jayadeva flyover my rear wheel started making a lot of noises. I knew that something was wrong at that point of time. At the start point handed over the papers to Parag to take over the race ownership. Srini told me to put coconut oil into the rear hub and continue riding, but Parag was sure of a cracked ball bearing. And I suspected something cracked too. I definitely wasn’t feeling too confident about the sound to ride 1200km. The ride started about 20m late and I zoomed off pronto. RR Cycles was 1km on the race route from the start, so I decided to barge in and requested them to fix my cycle. As luck would have it , the mechanics had just gone off for a late lunch. So I stood there fidgeting till they came back. Babu opened up the rear hub and showed me multiple cracked ball bearings. Meanwhile it started raining outside and as he was fixing it, I went out and pumped in 1/2 a litre of juice from a nearby juice shop. At about 4:45 or so the bike was ready.I also bought a couple of spare brake pads and went my way. I didn’t want to delve too much into the time delay. I knew I had a handicap of a hour and a half and the evening traffic to deal with. I had promised myself that I would not worry about rain, and decided not to carry any raincoat or poncho. The best way of dealing with rain , at least in the Indian monsoon is to just brave it out and rely on your body heat to keep you warm. Riding wet is better than riding with a raincoat once the rain dries out. (At least for me, that is what I’ve come to believe in) Of course , another learning from my aborted trip in 2014 was to ensure that I had adequate protection for my palms and fingers in the elevated climes of Ooty. I remember my fingers had become coompletely numb , rendering it extremely difficult to handle the breaks. So that meant that I needed some protection for my palm in the cold. I bought leather gloves a few days before the trip. Carried with me with the intent to use it for the Ooty leg. Thankfully the traffic was not too bad till I reached near Yeshwantpur and I managed to take the elevated flyway. The rain had also eased out by this time. I remember reaching Hassan Road in double quick time. However, my anxiety levels were still high, and would remain so till I caught up with at least a couple of folks. So I take the rather empty Mangalore highway and keep pedalling steady. The idea was to not get off the bike unless necessary. I had protein bars which I munched occasionally and a camelbak hydration pack (with a capacity of 2.1 litres) that I had filled with Kokum juice at the start of the journey. In addition to this a bottle of plain water in my bottle holder. I wanted to try and ride as much as possible as long as possible without breaking. My goal was to reach the 1st control , Belur , a distance of about 235km by about 2am (11 hours running time) Overall goal was to have at least a 3-4 hour buffer time at Madikeri, knowing that there was one big climb before Madikeri. As I continued my solo adventure it started raining a little heavily , and as I eased into the rain, I noticed what looked to me a pair of cyclists at a distance. The legs in motion definitely looked to be that of Anil Kadsur , to me. Anil was accompanying Archana , the sole female rider for safety reasons. He was hooded up to protect from the rain. As I passed him and Archana, I waved my hands, passed them and said Hi, but did not stop. I was in serious concentration mode, not wanting to waste any time. For the 1st time in the ride, I started feeling a little positive that I was at least ahead of someone else. The time was just after sunset , and the ethereal light of sunset was still holding nightfall at bay. Over some time I remember seeing a couple of guys taking breaks, and with every rider I passed, I grew in confidence of making the controls in time. I was not afraid of the Belur control, but I knew I needed a good buffer to make the Kalpetta control in time. I am yet to blog about my ride on Bliss In The Hills. But figured I need to write up on my 1st FM(Full Marathon) run on 18th Oct 2015. These days marathons are considered no big deal, with people doing Ironman distance triathlons, and ultra runs featuring 50, 100kms and even 24 hour challenges. I had got back to running earlier this year by running the TCS 10K in 50:48 and the Bangalore 10k (from the Bangalore Marathon organizers) in 49:07 seconds. The latter was on 12th July. I registered for the marathon around that time. I train on my own and along with 2 groups of runners within my APT complex. Its during one of my solo interal training runs that it happened. Our apartment block has a walking pathway that measures 910m. I was doing 250m and 150m interval training intersperced by approx 250m relaxed running. During my final run, I overdid a sprint. I felt a jolt of pain at the base of my bum, where the hamstring begins. This pain did not go away easily. I stopped running for a few days to see if the pain would ease, but it did not. My original goal was to run my first FM at a decent pace and run the HM in Mumbai in Jan pushing for speed. But thanks to my greed, I had the nagging feeling that I had injured myself. Of course finishing Bliss In The Hills was a priority for me , so i decided not to risk further injury( I was able to pedal without much issues), and was able to cycle at decent pace (I did Bangalore – Tirupattur – Bangalore , about 270 km in 10:30 including breaks), so decided not to push my luck. My goal was to wait till Oct 4th and then use the 14 days to train for the event. When the injury happened, I could barely walk, and going up and down stairs was painful. Eventually I could walk but my right leg was still strained. It was late September when I decided to take professional help. I went to Sparrc, Indiranagar (This is the place where I had gone last year to deal with another injury – Morton’s neuroma, which kept me off running fo 2 years). I completed 3-4 days of physio therapy (reflex -point therapy is what they call it) and I was in okay condition to ride Bliss In The Hills. Thankfully I managed to complete Bliss In The Hills. After completing BITH on Oct 4th (it took me a couple of days to start running , i was exhausted from BITH). The physio, Ganesh from sparrc advised me to run, but take it easy . “Sir you can run but don’t push for speed. Also if you feel any discomfort, please stop”. On 15th (Thu) I decided to try and run a little and gauge myself. I ran 3.7km in 21 minutes and felt i could go longer at that speed. However later in the day, my hamstring hurt and I was mildly rebuked by the physio for pushing myself. So nothing left to do but relax and run. I had not run more than a few km for more than 2 months. The longest I had run was the 12th July 10km run for a while. I decided to postpone the decision of running to as late as possible. I went and collected my bib, etc on Fri evening and then decided to just go to the start point. The start time itself was at 4:45 and the reporting time 04:00. So i had to sacrifice my sleep for the night. Slept 3 hours or so (but had compensated previous night by having an extended sleep and had taken a cat nap in the afternoon). Along with two other marathoners , Praveen and Shirisha from my apartment I went to the stadium. Praveen’s driver dropped us at the stadium. From the start time, I ran at a steady pace but well within myself ( or so I thought). At the 3km mark I checked it was 20 minutes, I decided to continue going at this pace, quickly calculating that it would be about 2:20 or so when i reached the half way mark. I decided not to fall in the trap of running faster when I spotted people whom I perceived as slower than me. Today was a test of my discipline on not running too fast, and I decided to stick to my relaxed pace. I remember the 4:00 and the 4:30 bus going ahead of me in Cubbon park. As I went past Cubbon road , the 04:45 bus went past me. I shouted out ‘Which bus is this?’ The bus driver shouted back ’04:45′ . Me : Does this bus have bus stops? He(taken aback) : Smiling , ha ha, good one. The armymen from Madras Sappers cheering us on the ring road around Ulsoor Lake. We took a right turn on to the Indira nagar 100ft road. After crossing CMH Road, I spotted the lead car and the time on it was 1:40 approximately. The lead runners were running behind. As I entered the inner ring road, I spotted Opendro running in the opposite direction – figured he was going to complete in less than 3:30. As I ran midway I mentally posted a goal of trying and completing the hm distance by 2:30 and then push the return to 2:15 or even 2:00 ( I had run a half marathon in 1:57:23 in Jan 2013 ) . I continued running at this pace and reached the 20km mark in around 02:10. As I approached the U turn point I spotted Kiran Kumar of Fitness through travels stretching on the other side. I remember thinking ‘I didn’t know he is fast’. Once I took the U turn , things started getting a little difficult for me. Things started going downhill from here. the U turn point was at Forum mall and at that point I felt a strain on my legs. After turning around, maybe a few hundred meters later I stopped running and decided to walk. After this I tried running but my legs refused to obey. From this point onwards I remeber really struggling. As I reached Koramangala police station, I needed to push harder. Once I took a left turn at Sony World, I must have had a clearly visible limp, because at almost every stall or aid station, people were approaching me and asking me ‘Are you okay, Sir?’ only for me to respond “Yes I am fine”. But I obviously wasn’t. In the inner ring road, the road is a little imperfect and the soles of my feet were beginning to hurt. I mean ‘Beginning to hurt’ , because it would get a little worse later on. One guy who overtook me told me to stretch. It was hurting to stretch my hamstring, I told him. I decided to try it. My hamstring was too tight, so I stretched my calf muscles for some time and then my hamstring, I could do a little stretching, and after stretching for 5 minutes I could move a little better. The hobble, walk, stretch technique of painful locomotion continued till I reached Old Madras Road. Now it was a little late and both sides had been opened to traffic. By this time a group of struggling runners had bunched together, in a rather unstructured way. Very different from the focused superpack that was visible at the start of the race. Once we came back to Cubbon road, it was easier. The road was not cordoned off and there was traffic but it was minimal and they were not getting in our way. We came across the red light at the Brigade Road (rather Kamraj road at this junction) intersection and ran through the red signal stopping traffic. The Fortis aid station at the fag end of the road had a volunteer rushing out with ice. I told her to give me the ice cubes, she wanted to ice me herself. Not wanting to waste time in conversation and still being in a hurry to finish the race( despite my snail’s pace now), I took the ice from her, firmly pressed it against the base of my hamstring and hobbled till the intersection fo Kasturba Road (JDP junction). At this point we had to cross over to the other side, which we did by running (!) across the road. About 100m before Mallya Road the 37km board lay down on the footpath, and I jumped over it. Now running on the road was very difficult as the pockmarked tar road was really searing my soles. For the first time in my life, I found barefoot running painful. “Chiddu, try using the footpath, it is much easier there.” Words, measured words from a friend who has cycled with me on multiple trips. Kiran was also running barefeet, and obviously was struggling as much as I was, to come to grips with the abrasion the soles were taking. So I continued , tiptoeing towards and continuing on the sidewalk. It was much more pleasant there, smooth stones as opposed to the dimpled surface that characterized the tar road. At one point near the Sheshadri memorial library, we had to cross the road. The route here was such that we had to complete a 3.5 km loop and come back , and there was a barricade separating us from the riders who had added 3.5 km to their kitty. By the time we reached the stretch parallel to Queen’s road , the drummers there were relaxing , exhausted!. Push , limp, motivate each other, look for the next pole as the target! We kept going ahead , feet by feet. Got on to the road next to Vidhan Soudha and finally back on to Cubbon Park. As we passed the library again, a coach (or motivator) was urging all the walkers to run. So I gave in and decided to limp harder (could not find a better expression to describe it). I limped, lunged , ran sideways and pushed the last 800 meters to conjure up a seemingly sprintish run . Once I crossed the line, the only emotion that I could detect was one of relief. I headed into the rehab tent, and had the pleasure of meeting Anil Kumar, another barefoot runner. He handed over his ice pack for me to put my foot on. PS : Had typed this long ago. Quickly completed a narrative and posted it now. The first edition of Bliss In The Hills was a success , judging from the number of participants and the interest it generated. We had riders from Gujarat, Himachal Pradesh, Delhi, Chennai, Tiruppur, Goa, Pune , Mumbai in addition to Bangalore. Or put it better, we had riders from all over India riding this brevet. 40 riders started and 4 finished, which was below our expectations. We did expect a few more to finish on time. In addition to the official finishers, Kaviarasu, Mehul and Sundaram Narayanan from Goa finished the ride but missed intermediate controls. Thanks to the volunteers Suman and Ravindra from Bangalore , and Karthik and his gang of friends from Tirupur for helping the riders in the manned controls. 1) The exit out of Bangalore will be streamlined. You will get out via Sankey Tank,CNR underpass and Yeshwantpur railway station, so the traffic will not be an issue. 2) We plan to change some of the routes in Wayanad. Last year on some stretches there was zero visibility due to fog. While we cannot completely guarantee anything, that particular stretch was through dense forest and the fog , in hindsight was expected. Attribute that to non familiriaty of terrain from the organizers. 3) Of course the distances will change, and there will be some additional sections to compensate for the stretches that have been truncated. This year we had opened up registrations earlier. The current registration format also follows last year. All participants who complete on time will be entitled to a medal and certificate. 4) Not so gentle rolling terrain. 7) Long clear stretches of highway for the flat lovers. The cumulative elevation of the ride should come to more than 15000m (As a comparison, PBP has a combined elevation gain of 11000 m and a 1200 conducted in January by Goa Cycling Club had an elevation of 13000 km). What makes Bliss In The Hills special is that it spans a wide geographical area. The lowest point is about 45m above sea level and the highest will be around 2400 m above sea level. The brevet is also at the fag end of the monsoon. So the chance of rain is ever present. 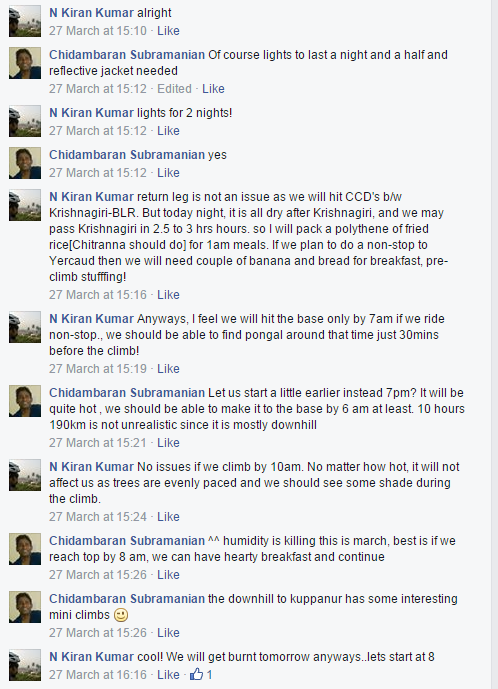 Last year, it rained the night the brevet was flagged off , and again it rained on day 3 when we were climbing Ooty. It is best to be prepared for heat, cold, some rain, some low visibility and foggy conditions and also a little extra humidity in Kerala. Here is a brief description of the route. You start from MG Road and head towards Nelamangala. From here you make your way towards Chikmagalur district to the temple town of Belur. From Belur you go towards the Madikeri. Gentle rolling terrain gradually gives way to longer climbs and descents. After traversing across Coorg, you go down the Sahyadri’s to a town called Iritty in Kerala.From here you work your way back up the mountain to the Wayanad Plateau. Kalpetta, in Wayanad will be your 1st control for support, and a recommended spot to get an extended sleep. From here you go via tea estates and climb to Ooty via Gudalur. You can smell the tea as you cycle past tea factories. Once you reach Ooty you go via a superlong downhill to Mettupalayam. From here you have a long highway stretch to reach Salem. From Salem you climb to Yercaud in the eastern Ghats, and then descend via beautiful woods to Kuppanur. From here you head north via a state highway and eventually climb Yelagiri, the last of the designated hills in the route. Finally you make your way to Bangalore via Hosur. The ride has been named *Bliss In The Hills* to reflect the overdose of serenity as you ride on arguably one of the most scenic routes of South India. Vaibhav C is one of the best selling authors of the world. I thought of this story while sleeping.I thought of writing this and publishing it so that all of you readers can read my book and enjoy it. I hope my readers will like this book. Tarun looked inside his history book. Arrey, very boring it was studying history ,because he had test the next day. He closed his book and put it in his bag. He felt like playing with his i-pad. He went to the hall and took out the Ipad. When his father was not looking, he closed the book, took the Ipad, went to his room and closed the door. He took out a pencil, jotted the words “DO NOT DISTURB, TARUN IS STUDYING FOR HIS HISTORY TEST” and hung it outside his locked room. Then he played on the ipad. He played 10 car and bus races, and after that he played an hour of angry birds. After playing for about an hour, he turned off the ipad. He got bored and tired and just slept. After sleeping for about half an hour on his bed,he woke up. After he woke up his mind felt relaxed. Then he went out of his room to the living room and found his father watching TV. His father asked him if he had finished studying. “Yes” – he replied. Then he went to the dining room and helped himself with three Dosas and chutney. After eating he went to his room and slept. He had a dream that he was doing his history test. He finished writing the answers and handed over his test sheets to his teacher. His teacher corrected his paper and handed it back to him. He saw that he had scored 50out of 50. He was thrilled and excited. Tarun woke up the next day with the fresh breeze caressing his face. He got ready for school, went to the school bus stop and waited. Chethan responded “What a coincidence? I too dreamt the same”. After they reached school, they went to their classes and got ready for the test. Their teacher Ms Shaila handed out the papers to everyone in the class and asked them to start writing the answers. Everyone started writing the answers. Tarun found the paper to be very tough. He however hoped that his dream would come true. He started writing the answers and finished the paper in two hours.He handed over the answer papers to Mrs Shaila after finishing the test. While going back home on the bus , he again had a chat with Chethan. He said “This was the toughest paper in my life. I do not think I will get good marks”. The bus reached his home. He got out of the bus after saying Good bye to Chethan. After he went to his house, his father asked “How was the paper Tarun?”. “Very Tough” – replied Tarun. His teacher had mentioned that she would be giving the papers the day after she finished correcting them. Tarun could not wait to get the papers back. He wanted to know how many marks he had got. He went to his room and played with the I-pad for 15 minutes. He went to the ground and played cricket with his friends. While batting he hit 3 sixers nd 5 fours. He scored forty seven runs. He was very happy. His friends praised him. He went backto his house. He ate his favourite food for dinner – “Dosa with Chutney powder”. After dinner he went to his room and played with the Ipad. After playing Ipad he kept thinking how much marks he would get and went to sleep. Once school was over, he ran towards the forest. Mr Narayan asked him where he was going. Tarun lied that he was going to his relative’s house who was living almost 2 miles away from his school. He continued running and was very tired upon reaching the entrance of the forest. He drank water and walked inside the forest. The sky had become dark. He was hungry. Luckily he had not eaten his lunch in school. So he took out his lunch and started eating. Dr Ramakrishna was thinking why Tarun had not yet come. He called the school principal and asked why Tarun had not yet come. The principal told that he had sent all the buses along with the children about 2 hours ago. Dr Ramakrishan then called the driver of the bus. The driver told ” I had not seen Tarun come in the bus. I searched the whole school but in vain”. Dr Ramakrishna thought that maybe Tarun was walking home with his friends. He waited for half an hour. But Tarun had not yet come. He went ouof the house and searched for Tarun everywhere, at his friends’ houses, in his school, etc. But, he could not find Tarun. For a moment he got scared that maybe Tarun had got hurt or got kidnapped. But no, Tarun was in Grade 8, he could defend himself , so no one oculd kidnap or attack Tarun. But why had he not come home ? He went back home, scared about what had happenned to Tarun.He called Tarun’s mother, Mrs Jyoti who had gone for shpping that Tarun had not yet come home. “What” she screamed. How come Tarun has not yet come home. Maybe he is in his friend’s house. But no dear. I searched everywhere but could not find him – said Dr Ramakrishna. Mrs Jyoti goes to the police station. The police man thought for a while and said ” Why don’t you make a poster and stick them on trees and walls? ” “Oh yes – thank you sir!” said Mrs Jyoti and went out of the police station. Mrs Jyoti reached her house and rang the doorbell. Dr Ramakrishna opened the door. She said ” I found a way which can help us find Tarun. We should make posters and stick them on trees and walls. Is that not a good idea ?” Yes I will make the posters immediately, said Dr Ramakrishna. 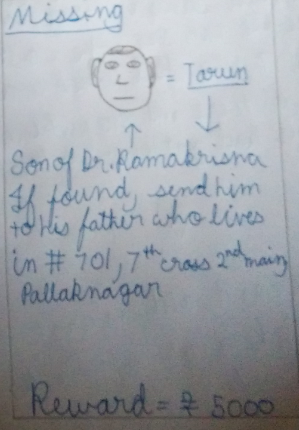 Dr Ramakrishna took an A4 sheet, outlined a picture of Tarun and started to write. Once he was done , heprinted 50 copies of the poster . He stuck the 1st poster on the famous banyan tree so that many people can see the poster. Then he stuck the poster on a wall, which was very long. He stuck them here and there and everywhere till he ran out of posters. He went home and told his wife that he had finished his job of sticking the posters. His wife prayed to God that Tarun should reach home safe and sound. Tarun finished eating his lunch. He started walking and he found a strange looking beetle. As he was walking he felt tired as well. While walking he encountered a vilager cycling. The villager said. “Why are you roaming in the forest? You might get lost!” . “Er .. I was just looking for my father ” – said Tarun. The villager said “You poor thing, you can get lost” The villager gave him some water and pointed in the direction of the city. Tarun gratefully accepted the water and bade the villager goodbye. He took shelter under a huge tree. He sighed. Maybe he should not have run away like this. Maybe he should go home. His parents would be worried a lot about him. He thought of going back home. But he was 10 miles away. Slowly he started walking home. Dr Ramakrishna waited, at last he heard the doorbell ring. He opened the door to find Dr Narayan standing there. Dr Narayan said he saw Tarun running towards the forest. He also said that Tarun told him that he was going to his relatives’s house. After that Dr Ramakrishna thought why would Tarun lie? There must be some reason behind it. He walked towards the forest. Maybe someone was tricking or influencing him? But he knew that Tarun could not get influenced or tricked. But … some reason was behind it. He looked at his watch, it was 10pm and every very dark. He entered the forest. He heard sertain scratching and chirping sounds. He took out his flaishlight and shone it on eht path. He called out “Tarun, Tarun! Where are you? I am going to help and get you out of here”. There was no reply. Maybe Tarun was scared and hiding somewhere? He continued walking. Yercaud , third time lucky? She : Nice , who else is coming with you? She : Please get some company. Try putting onf facebook , you might get someone. So I post on Facebook, a little tentatively. Instead of yercaud, I vaguely word it as a night ride, thinking I would have better chance of getting company by posting a ride and quietly cranking up the distance to Yercaudesque levels. ( Of course I was prepared to compromise by maybe going to Mysore and back or Yelagiri and back). 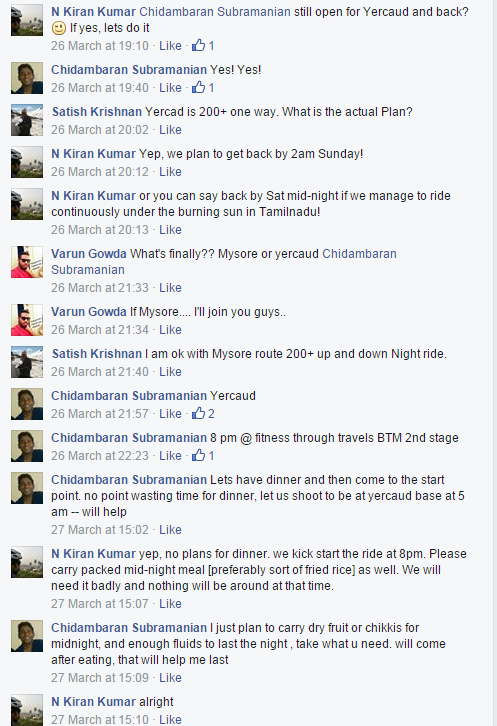 I posted on Wednesday and by Thursday evening I had Kiran Kumar (of Fitness Through Travel) also wanting to do the Yercaud circuit. I closed the deal over a facebook post. And to make things better, Sylvester with whom I have ridden the 600 (and other rides) also deciding to jump in. One person who had said yes, opted out but we had a good 3 members, a good crowd for a 450 km ride at less than 2 day’s notice. We decided to start at 8 pm but of course a mixture of laziness, unexpected last minute gotchas and an irrational fear of Bangalore traffic meant that we left Silk Board at 10 pm. The stretchh towards Attibele probably took for ever with frequent breaks due to traffic. Of course the traffic either decided to linger till 10pm and beyond or it must have been messier earlier. We rode at the pace the traffic permitted us to and reached Attibele toll plaza. Sylvie was a bit behind and we waited for him. The first real action came on top of the Hosur flyover, where we were stuck for 15 minutes or more. So much for delaying the trip to avoid traffic. Once we reached the base there were few diversions and more traffic jams. We were separated as each of us tried to squeeze through wherever we could. Eventually we reached relatively freer movement and I pedalled hard. Found Kiran waiting for me 5-10 km beyond Hosur. We waited about 5 minutes for Sylvester and then decided he must be ahead. So we continued , we met him waiting at the Krishnagiri toll plaza , and the time must have been some time after 1am. The real killer came when we got stuck on *top* of the Krishnagiri flyover for another 20 minutes or so. This was beyond weird. Bangalore traffic had either reached Krishnagiri or there is a mass exodus every weekend from Bangalore. Either ways, in future it pays to brave the Electronic city traffic jam than getting stuck in the middle of the night at Krishnagiri. I connect the phone to my ear plugs/mike and now start listening to music. I make the descent quickly , noticing that the NHAI had now made the road much smoother (no longer those ridiculous rumblers that threatened to create a fall ) , after a couple of short breaks to stretch a strained back I saw myself in the outskirts of Salem sometime after 7:30 . Kiran called and he was about 20 km behind me. I told him I’m going ahead. Went to Annapoorna restaurant , had a good breakfast and then some cleanup. I had to fill my camelbak, asked the waiter to do the needful — as expected curious glances all around. Finally I found myself at the base at about 9:20. There was a tendro coconut vendor and I decided to load up on one tender coconut. Deed done, I started the climb. I had 2 liters of plain water on my back, and a liter of concentrated electrolyte solution (double dose) in my water bottle ( Remember this was my third time here, I knew that for the next 23 km there would be nothing, and while the climb is not steep, it is long , and I was expecting less shade due to the summer). And yes, it was hot, very hot even though the time was just 9:20 am. As I would discover later it got a little pleasant after the 7km mark or so, but the humidity was quite relentless. I had decided to be open about the climb. With my excess 10kg of body weight , extra humidity is a killer and I really lose a lot of fluids in hot and humid conditions. I went well below my threshold but still found myself panting. Every 2km or so I forced myself to take a break, whenever I found a shade. And I gulped the salts every 2 km. When I visited in September there was a lot of shade enroute the climb. Right now, it was completely desiccated, and I had no option but to bear relentless sun.Once I reached the top I checked the time. I had made it at around 12:01 pm or so. I actually thought I had taken much longer than 3 hours so was a bit surprised pleasantly (though wasn’t shooting for time, I was happy to make it one piece). And of course, I had to take the requisite selfie to prove my ascent. Once I reached the top, I tried calling up the other two but no response. Soon though, Sylv called back using another phone and indicated that he had called off the climb. I tried to convince him to continue and waited. Had a relaxed sleep sleep on the parapet wall at the edge of the final hairpin. Soon I was woken up by a phone, and it turned out to be Sylvester again. He told me that he had given up after walking a km and then took a bus up. He had reached the top and was on his way back from town to the end of the climb (A distance of 2 km or so). He joined me and we whiled time away chatting. He had passed Kiran 2/3rd the way to the top, so we were expecting Kiran to reach soon. I think Kiran made it to the top around 2:30 pm or so. Unlike me, he managed to ride to the top non-stop. Quite a feat in the heat and humidity. We went from here to the town together with Sylvie ending up a bit ahead. Just spent a couple of minutes next to the lake with Kiran when we realized Sylvie had taken a detour to Hotel Tamil Nadu , just before the lake. We went back to the hotel, and had a veg buffet meal at Hotel Tamil Nadu. We decided to chill at the top and wait for late evening to get down. Both of them updated me with the detailed story of why they were late. Apparently they took a short cut and did some offroad trails to hit the base of the climb. That explained the delay of them catching up with me. We decided to take up a room and sleep for a few hours. Unfortunately it was a weekend and the hotel was full. 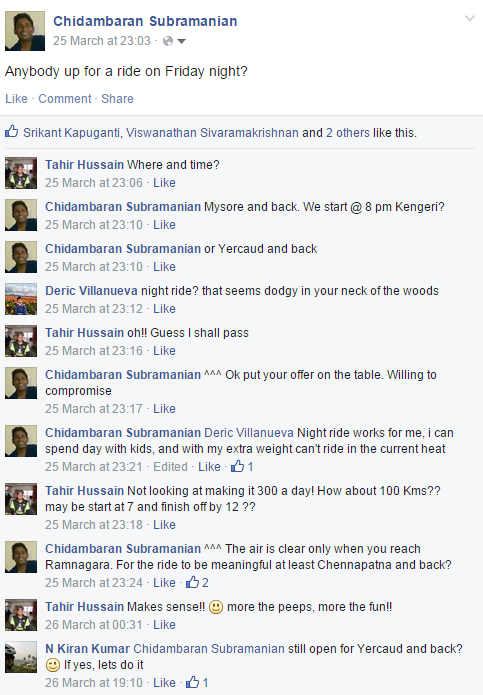 of course Sylvie wanted to find a way to get to Coimbatore quickly. On my recommendation we went to Annapoorna to have a quick snack. We ordered 2 plates of Sweet Paniyaram and 3 Dosas for each of us. The Sweet Paniyarams were really delectable fried in Ghee. We sat near the entrace near the place where they were making the paniyarams. The smell of freshly cooked desi food has its own way of relaxing your tired muscles. But We couldn’t finish it off, managed to pack one and carry it on t.
losing a lot of fluids — guess one of the disadvantages of having extra body weight. I searched for a medical shop but could not find one on the way. We were advised to try someay down the road. But I was so dazed that I could not focus too much on the sides of the road. All the shops more or less felt a blur. I ended up going ahead and waited just after the Mettur dam turn off before Thoppur. Kiran joined me and was a little non-plussed because he had stopped at the hospital and medical shop expecting me to wait there. I told him I had a very dim idea of the sides of the road and could only focus on the road.We went ahead and located a row of shops just before the thoppur climb. I downed a Slice and an ORS tetrapack and bought 2 more ORS satchets. This helped us complete the Thoppur climb in about 30 minutes, Once we reached the top we located a petrol bunk and slept at the back for about 2 hours or more. only to be greeted by the sight of Kiran sleeping on a slab by the roadside next to a transformer. I joined him in sitting pose for a few minutes and post (by now I lost count of number of) nap, we continued towards Krishnagiri. Just before the road from chennai joins the highway, there are a bunch of eateries on the right side of the road (against the direction we were going). Kiran wished to infuse some nutrition before the climbs/rolling terrain from Krishnagiri to Hosur. I wasn’t keen on eating much, was happy to survive on fluids, but hunger rules so we stopped there. While Kiran was having his meal, I decided to spend the time sleeping, which I duly did by putting my head on the dining table and dozing off. From what I remember, I managed to sleep more than 45 minutes at this spot. By the time we decided to start from here, it was close to daybreak. And again we took another break in a petrol bunk just some distance before the initial climb from Krishnagiri started. Now came the best part of the entire trip. Tackling a fairly sustained climb/rolling terrain early in the morning after a decent rest at night. It must have been about 5:30 or so when we started past Krishnagiri. The first climb to Chinnar tends to be the most intense, but the saga of rolling terrain goes all the way to Hosur. The steepest section I believe is barely a km or two before we hit the town. After completing the Chinnar climb (that ends in Adyar Ananda Bhavan) , I remembered that Kiran had packed a sweet paniyaram from last night’s dinner snack. I pronto asked him as we were riding on a flat part of the terrain. I enjoyed the ghee laden sweet paniyaram on the climb. Made my morning really memorable. That is my fondest memory of the climb. The sun started getting a little tricky even a little after 7 am. So I decided to push and go ahead. A couple of times I caught Kiran off the saddle coming from behind. Later on he would tell me that he struggled to catch up with me on the climb. Of course such a statement just boosted my ego, that meant I was not in that bad a shape as It thought I was. By the time we reached Hosur it was about 8:10. We went to the local Saravana Bhavan (on my recommendation). I noticed that the place was renovated ( I must have visited it last probably 2010). The morning lone paniyaram was topped up by a ghee roast and Pongal Vada. The chutney was also awesome. By the time we started from Hosur it was around 9:30 and the sun was seriously beating down on us. I ended up going ahead in a minor traffic jam before the toll plaza. Given that there was no shade I did not wait for Kiran. At times the heat was making it difficult and I felt faint at times. I just kept sipping a little hydration fluid , but I had mild acidity issues so stuck to water. The first ‘shade’ on the road was when the electronic city overhead expressway began and I waited for some time here. I rode slowly from here and Kiran caught up soon. I declined his offer of a juice shop break since I was no eager to get home as soon as possible. I had to drop my mother in law to the airport and had to go to a cousins’ engagement in the evening. I went home , had a quick meal and then slept for an hour or so. I got up, drove to the airport , then headed to Jakkur at 5 pm for the function. I came back home probably at 9 pm and only then did I manage a good night’s sleep. Surprisingly for the length of the journey, I had no cramps at all either during the day or the next. And yes, I ended up gaining a kg of weight after the ride. PS : If you are curious about the title, I had planned two trips to Yercaud before BlissInTheHills, but both times ended up transporting the cycle back in a bus. This, for me , was third time lucky as I completed the round trip on a bike. The next trip to Yercaud will include the stretch to Kuppanur.